Skylight Quartet Store - CDs or Downloads! 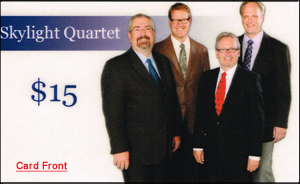 The Skylight Quartet has four CD's available - Our newest recording... just out in 2015... "Turn Your Back", plus "We Sure Do Need Him Now" and "Praises4Him" (the quartet was previously named Praises4Him). Mike Looney, our newest member, also offers his solo CD, "I Do Believe." For those who prefer to download their music and also have the flexibility to select each individual song, the DropCard option is also available below (13 user-selected songs from our total collection for $15). Please use the Add to Cart buttons below if buying just one CD. If you prefer to buy more than one CD, a discount option is available at right. Simply select the number of CD's desired and write the titles of the CD's in as many boxes as needed. If you wish to buy multiple copies of the same CD, also use the form at right to receive the discount. Just repeat the name of the CD for each copy that you want to receive. Please note that a $3.50 shipping and handling fee will be added to each order of up to three CD's. Buy a Dropcard for $15 ... Purchase Downloads of Skylight Music! Purchasing a $15.00 Skylight Quartet Gift Card will allow you to go to www.dropcard.com, enter your code from the back of the card and download up to 15 songs directly to your computer. You will have over 34 Skylight songs to choose from. Order the gift card and it will be mailed directly to you to give as a gift or to download songs yourself to burn on your own CD.